In addition to providing the consumer market with authentic Himalayan products for personal, home use, SALTOPIA is also dedicated to helping spas and holistic wellness centers build out salt caves! Salt caves have been used for hundreds of years as a form of therapy. Salt therapy is also known as Spelotherapy or Halotherapy. In many European countries, the treatment is recommended by doctors and is even covered by health insurance. The most famous salt cave was set up 150 years ago, by a Polish physician who found that salt miners didn’t suffer from any lung diseases. A salt cave was then carved within the Wieliczka Salt Mines and became popular among those suffering from respiratory diseases. This mine is still in use today, as is another salt mine in Bochnia, Poland, which has been active since 1248. People suffering from allergies, neurological and rheumatoid problems are recommended to visit for the salt caves therapeutic value. Studies show that people who live in places with high levels of air pollution have a 20 percent higher risk of lung cancer than people who live in less-polluted areas. Anyone who lives in or has visited New York City can attest to the air pollution. A quick trip to the ocean or the mountains brings instant relief to respiratory struggles. Salt caves work in the same way. Himalayan salt creates negative ions and air charged with negative ions suppresses serotonin within the body, which initiates higher energy levels and positive moods. Salt caves are not only incredibly safe for children but highly beneficial. Spelotherapy is often recommended by doctors in Europe to treat children with respiratory illnesses. The Belarus National Speleotherapy Clinic is a fully operational salt mine. Thousands of children visit each year and the local government claims that as many as 97 percent of its patients experience improved health. In 2006, a study published in the New England Journal of Medicine found that inhaling a high concentration of saline improved lung function in cystic fibrosis sufferers. Another 2006 study published in the European Respiratory Journal showed that cigarette smokers who inhaled the ions from Himalayan salt had improved smoking-related symptoms, such as coughing and mucus production. 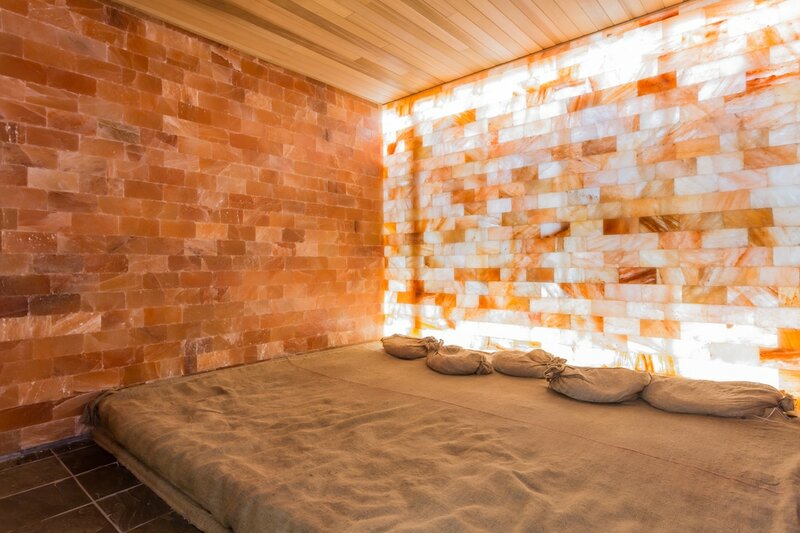 It’s been proven by holistic wellness and healing centers around the world, that spending time in salt caves offers a relaxation benefit that resonates for days after the official treatment session has ended. Western medicine does not support any of the research or findings listed here or within our other literature. While our Earth is filled with naturally occurring remedies for almost anything that ails you, please know that SALTOPIA’s information is offered for educational purposes and is not intended to replace the advice of your family doctor. Please note: SALTOPIA is extremely selective in where we build our certified authentic salt caves. We refuse to partner with companies or individuals who choose to use glue, cements or chemical adhesives to adhere pure Himalayan salt products to walls or floors of salt caves. This disrupts the purity of the salt cave itself, and defeats the purpose overall.